A new tradition among high school graduates that gives a nod to nostalgia is spreading here in Kitsap County. 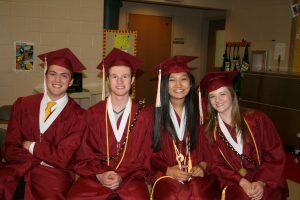 Last week, members of Bremerton’s senior class visited their elementary schools on graduation day, wearing their caps and gowns. The idea came from a Texas high school, whose images went viral after its seniors journeyed the halls of the local elementary schools. 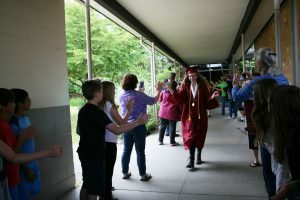 On Monday, seniors from South Kitsap High School stopped in on South Colby Elementary for a trip down memory lane … and to inspire younger students. 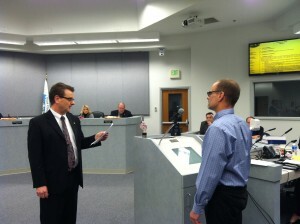 Here are a few photos provided by South Kitsap School District. This is Anna Somerville walking down the breezeway through the tunnel of high fives and cheers. Anna was the senior field marshal for the SKHS marching band this year, and she is going to The Honors College at WSU. Below is a group of grads (left to right): Richard James (who will be going on a mission to Utah in July), Kevin Morrison (low brass section leader in the SKHS band. He’s participated in wrestling and track, and is going to George Fox to study engineering), Analise Burko (president of the National Honor Society. She’s participated in basketball and tennis, and is going to the university of Washington to study biomedical engineering), and Chloe Meyers (low brass section leader in the SKHS band, who was on swim team and in the school play. Chloe is going to The Honors College at WSU to study chemistry and pre-med). South Colby students gave the graduates messages of encouragement. 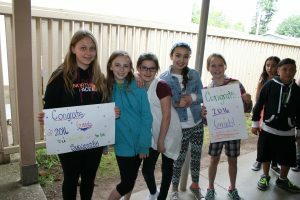 From left to right: Karissa Gay, Hanna Spencer, Phoebe Chobot, Gracie Thompson, Alisa Young, Jayden Lynch, Emma Keddy. For today’s story on a fast-track certification program for teachers in career and technical education, I visit John Thornton’s Bio-medical Research & Global Health class at West Sound Technical Skills Center. Thornton, a retired Navy corpsman, recently graduated from a program at Olympic College that counts work experience toward teacher certification. The program could help address a shortage of career and technical education teachers in Washington State, OC officials say. There’s a growing interest in CTE, which allows students to explore possible career fields, earn certification for entry level jobs and pursue a plan of study that leads to post-secondary education with a tight focus on a specific career or skill. Although most of Thornton’s students plan to go to college and beyond, they could qualify right now for entry level laboratory jobs. As I toured the lab, I had to keep reminding myself these were high school students. I interviewed lab supervisor Hannah Whitbeck, 17, of Chimacum, on her study of a new gel being used to promote clotting in battlefield wounds. Whitbeck, a senior in white lab coat, showed me around the lab, which has equipment such as a spectrophotometer, for analyzing samples by the light absorbed in each, and an incubator, in which students were cultivating bacterial samples from swabs of epithelial cells in their mouths. Nothing nasty found, by the way. Brandon Hoover a South Kitsap High School junior had designed a water purification system using materials, like cardboard, rocks and plastic funnels, that could be readily found in most settings, including third world countries. He called it the Zimbabwe Project. The frame is made of sturdy recycled cardboard. Water is poured through a series of funnels. The rocks remove larger debris. The water is then boiled and the steam is captured as condensed water in five-gallon jugs. Kelsey Lantrip also of South Kitsap High School, researched the potential toxicity of crumb rubber used in artificial turf. Lantrip showed me Petri dishes containing samples from turf fields at Bainbridge Island’s Strawberry Hill Park and South Kitsap High School’s new turf field, which uses natural materials like ground coconut husks instead of crumb rubber, as on most turf fields. Lantrip said she tested to see whether the samples were mutagenic, likely to increase the frequency of mutation in an organism. South Kitsap’s samples were not mutagenic; the Bainbridge samples were. Granted the samples are small, and this is not proof that either substance is carcinogenic or safe. But it’s a start. “I think this is a small portion of what could be done,” said Lantrip, who advocates systematic study of turf fields, as has been proposed nationally. Carry on, kids, and thanks for the tour. The students took a trip to Seattle’s Gum Wall, before it was demolished and took lab samples. They were even interviewed by a Seattle TV station. Remarkably, all they found was normal flora. Two children were confirmed dead today by the Mason County Sheriff’s Department in a shooting in Belfair that left the gunman and two other people dead. The home where the shooting occurred was nowhere near schools in North Mason School District and school continued without interruption. Inevitably, however, the whole community will be affected. North Mason School District Superintendent Dana Rosenbach posted the following message, copied below in full, on the district’s website. Today has been a tragic day and we are all affected by the great loss. As parents you may want to talk to your children about today’s tragedies and their impact. Witnessing or even hearing of a traumatic incident may affect a child or adult in a variety of ways. Therefore, it is very important that children be given ample opportunities to ask questions and to talk about their reactions to the incidents. Currently children may also have concerns about their safety and security and consequently may need reassurance. Over the next two days, you may find your children need to discuss their questions and concerns with you. For that reason, we are providing the information at the end of this message. Over the weekend, or at any time, you may access the Lewis/Mason Crime Victim Service Center at 1-888-288-9221 for 24 hour help in dealing with trauma. In addition, you can get more support at the National Traumatic Stress Network (http://nctsnet.org/). • Assure fearful children that you will be there to take care of them. Reassure them many times. • Provide physical closeness. Spend extra time putting your child back to bed. Talk and offer reassurance. • Encourage children to ask questions and to discuss, write or draw their feelings. • Be a good listener. Listen carefully for any misconceptions or distortions the student may have regarding what happened. • Talk with your child and provide simple, accurate information to questions. • Provide play and fun experiences to relieve tension. • Remind them of concrete examples of where they are being protected and cared for by parents, adults, teachers, police, etc. • Make sure the child gets rest and exercise. 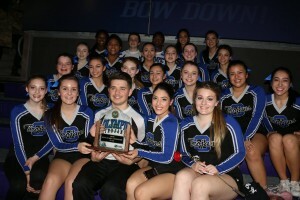 Olympic High School’s varsity cheer squad has brought home a state trophy … again. This is the fifth time since Coach Kristie Freeman took on the team in 1990. The competition took place Jan. 30 at the University of Washington. The 20-member Oly team competed in the co-ed cheer division of similarly sized squads (non-tumbling). Here’s a video from the team. “I would say they work just as hard as any other sport in our school,” Freeman said. The cheer season (like most fall sports) begins in the mid-summer. Besides learning routines, cheer squad members spend hours each week in conditioning, running, sit-ups, push-ups. In the video, you’ll see team members lift others in the air and deftly catch them coming down. That takes strength and coordination. Throughout the fall, the squad takes part in regional competitions. Advancing to state requires a certain number of points, earned at lower level competitions. Meanwhile, the squad cheers on other athletes at football and basketball games. They are busy nearly every day July through January, and the season continues in February with basketball playoffs. “I’m really proud of the kids. They worked really, really hard, and they did everything I asked them to do,” Freeman said. This is not a sport for prima donnas. “There are no standouts. It’s a group effort,” Freeman said. Routines are tightly choreographed. Freeman herself has never been a cheerleader. She began coaching cheer in 1978 in Raymond, Wash., when the cheer squad there needed a leader or would have folded. Congratulations, Oly cheer squad. You rock. And now a roundup of this week’s education news in Kitsap and beyond. Follow the news as it happens at kitsapsun.com and on Facebook at https://www.facebook.com/chrishenryreporter/. Contact Kitsap Sun education reporter Chris Henry at (360) 792-9219 or christina.henry@kitsapsun.com. A team of Kitsap Sun reporters looked at what would happen to Kitsap County in an earthquake on the Seattle Fault of a magnitude 7.0 or greater. Local districts have long-term plans for replacing buildings and have identified those that are oldest and most at risk, but the reality is replacing or retrofitting all the schools in Kitsap County will take decades. If you haven’t had a chance to checkout the Kitsap Sun’s comprehensive package on “Our Big One,” I highly recommend you take some time with it. The package is available on mobile devices but because of the number of graphic illustrations, it may be more easily viewed on tablets or laptops. 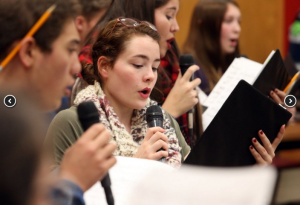 South Kitsap High School’s Highlighters jazz ensemble, Chamber Choir and Women’s Ensemble will travel to New York City in March for an invitational performance event at the famed Carnegie Hall. Only 16 districts in the country made the cut. South Kitsap Choir Boosters plans a rummage sale 3-7 p.m. Jan. 22 and 8 a.m. to 2 p.m. Jan. 23 at the Port Orchard Pavilion. Here, in case you missed it, is a video of the Highlighters doing their thing. The relatively affluent district is the last in Kitsap County to offer tuition-free, all day kindergarten. The new deal starts in the 2016-2017 school year. The state has been ramping up its funding for all-day kindergarten, starting with the least affluent districts. In 2015 the Legislature agreed to cover the cost of all-day kindergarten for all districts in the upcoming school year. Bainbridge parents can learn about the new program at a meeting 6-7:30 p.m. Feb. 3 in the Ordway Elementary School Multipurpose Room. The Governor said he wants to address the teacher shortage by raising beginning teacher salaries from about $36,000 a year to $40,000 annually, in this story by the Associated Press. 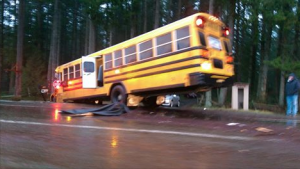 A collision Jan. 13 involving a South Kitsap school bus, a pickup truck towing a trailer of bark and a passenger car resulted in one student and the bus driver being taken to Harrison Medical Center. The student was evaluated as a “precautionary” measure, according to the Washington State Patrol. Students on the bus, all from Sunnyslope Elementary School, were safely evacuated. Counselors were available at school the next day to support students after the accident, said district Spokeswoman Amy Miller. The truck’s driver was cited for driving too fast for conditions, the WSP said. Coming up next week: a roundup of bonds and levies on the Feb. 9 ballot. The city soon will make public the application documents of the six people deemed eligible for filling the district 3 council position vacated by new Mayor Rob Putaansuu. I offer them now for your viewing pleasure. I’ve included the incomplete packet submitted by Jaqulynne Ford, who is not eligible due to lacking a cover letter and response to council questions, City Clerk Brandy Rinearson said..
And yes, I will be asking Brandy how residency is verified … for all candidates. If you have any trouble with these links, email me at christina.henry@kitsapsun.com. Katrina Asay, chairwoman of the Washington State Public Disclosure Commission, will be part of a panel of speakers on the topic of money and politics at a forum hosted by the League of Women Voters of Kitsap Thursday in Poulsbo. The panel will speak on how money influences state, local and national elections, especially since the Supreme Court’s Citizens United decision in 2010. The Public Disclosure Commission oversees campaign finance in state and local elections, hosting a public database of campaign contributions and expenditures, including sources of funding for and against candidates and ballot measures. Campaign finance was a hot topic in Port Orchard elections during the 2016 election season. Asay, a former member of the state House of Representatives and former mayor of Milton in Pierce County, will be joined by PDC spokeswoman Lori Anderson. Also on the panel is Dean Nielsen, principal of Cerillion N4 Partners, a political consulting firm, and Serena Larkin, a senior communications associate with Sightline Institute. She was a member of the communications team for the Honest Elections Seattle campaign. The forum will be from 6:30 to 9 p.m. at Poulsbo City Hall, 200 NE Moe St. It will be recorded for future broadcast by BKAT, Comcast Ch. 12 and WAVE Broadband, Ch. 3. For information, visit lwv-kitsap.org, or e-mail Kim Abel at kbabel@wavecable.com. 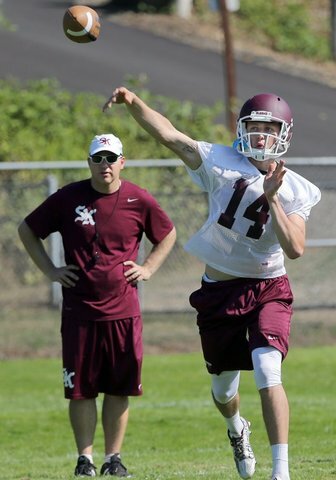 Football season kicks off tomorrow at South Kitsap High School with a new coach and a new turf field. The Wolves play Central Kitsap, guided by coach Gavin Kralik, who is profiled in the Kitsap Sun’s football tab, Kickoff, 2015. The special section gives highlights on how this year’s season is shaping up throughout Kitsap and North Mason counties. Before the game, district officials will host a dedication of the new, high tech turf field and track that were built thanks to donations of more than $500,000 from Kitsap Bank and $150,000 from author Debbie Macomber and family. Joe Knowles won’t lose his spot of honor at the school, where people will refer to “Joe Knowles Field at Kitsap Bank Stadium.” The track will be named in honor of the late Dale Macomber, son of Debbie and Wayne Macomber. “What an opportunity we have — this team of incredible, generous and innovative individuals has come together and forged a partnership that will change this community and inspire its young people for generations to come. What we are doing is truly special,” said Superintendent Michelle Reid. Central Kitsap High School also has a new turf field, or rather a resurfacing of its turf. North Mason will get a turf field next year, leaving Bremerton the last district waiting in the wings. Congrats South on your new field. Go Wolves!